The interest in business digitization is growing incrementally due to accelerating pace of technological modernization and implementation of digital technologies. Food industry is one of the spheres that need to be seriously innovated. 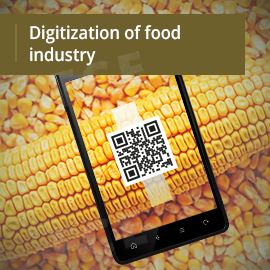 Digitization opens new possibilities for food industry by transferring most production, management and distribution processes into digital sphere, seriously raising their flexibility and efficiency. One of the basic elements of digitization is easy access and collection of data. By excluding the paperwork from the business processes and implementing document flow to the blockchain, any member of supply chain can benefit from the system. The benefit of blockchain consists in full traceability of any element of the supply chain, which cannot be faked or unreasonably modified. Obvious result of digitization of food industry is reduction of working capital and administrative costs, providing ways for planning the optimization in order to comply with the highest quality standards.